My new Ham radio shack desk is almost finished. I made a similar one a long time ago and it got thrown out. It was good while it lasted, but this one I think will be the last Ham radio shack desk I ever need. 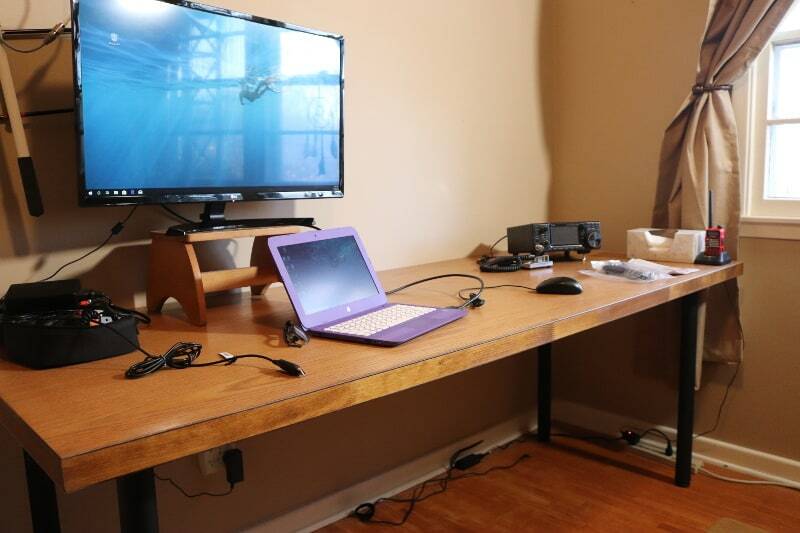 The depth of the desk is very important to us Hams and this one costs less than $150 to make. The entire process took a few days and I’ll show you how I did it below. After finishing in the garage, it took two of us to move into the new Ham shack. It’s a solid core oak door purchased from our Menards store in Pierre, SD. This is one beast of a slab weighing in at 89 lbs. Mastercraft® 32″ W x 80″ H x 1-3/4″ Ready-to-Finish Oak Solid Core Door Slab. I chose the 32″ x 80″ and they have a couple even deeper if you like. There are a lot of choices out there. My first desk I just used two filing cabinets with a hollow door and that worked good. This time I chose to go with table legs and solid oak. I got the legs from Amazon and there are many to choose from. I wanted something that looked good, held up the weight, was the right height for me and I wanted to be able to remove the legs easily. My choice: Action Club 28″ Height Tall Adjustable Metal Office Table Furniture Leg Set Black,Set of 4. I like the way they look, but they are not as steady as I would have liked, so I am going to attach the desk to the wall. The weight won’t be a problem for the legs because they are rated for a vertical load of 220 lbs. each. I will buy another set for an additional table. Later I saw some other options. This looks like a good one: H28″, Rusty Design, BKH1728 Pipe Legs KIT for Writing Desk, Computer Table, H-Shape, W17″ x H28″, Pack of 2 suitable for 1 Table. I like the pipe design. I won’t bore you. there are lots of videos on YouTube finishing tables. It’s sanded using 180 then 220 grit sandpaper, a nice golden oak stain (one coat), polyurethane spray (I’ll brush next time), and paste wax. I attached the legs after moving the desk into the new Ham shack. I’ll have to reroute my coax from the old shack to the new shack and then of course move the equipment. The desk may need a shelf, but that will come later. I may be done by Christmas, HI! I got some good recommendations to leave room behind the desk for access and I wanted to do that, however I don’t have the room and I will need to attach the desk to the wall. I’ll attach another table making an “L” shape and it’ll have room behind it. Thank you for subscribing to this website. I appreciate the comments, questions and suggestions. Please comment below and follow me on Twitter, Facebook, Instagram and YouTube if you have those. I done the same thing. Only I got a hold of a bunch of doors that had been took down. The side were the hole was I used that to pull some smaller wires through . Then I took another door and made the legs . Were the legs go I routed out a slot wide enough for the legs to fit in. Finished with a light walnut because they were close to that. Then about four coats of clear. They make fine operators desk. Strong enough to set a big amp on or what ever you want to do. Nice to hear from you and thanks for commenting. That’s a great idea and I agree, they do make a very good desk. I think I am going to do another one. I’m looking for some drawers to go under the one I have now. Thanks again, Happy Holidays and Merry Christmas! Nice to hear from you Dennis. Thank you and please do. I will be making a desk addition too for boat anchors. I’m looking for a National NC-57 if anyone has a working one in good shape. Looks good. I will send pics when I finish the loft where the 7600 is going. Basement has a workbench and a hollow core door on two file cabinets. It is for all the boat anchors. Your new desk looks great!!! Looks like it is heavy duty. I have an older office desk, and keep thinking about building something new – but once I think about the effort moving everything out of a small office – I tell myself I am happy with what I have. Again – The Looks Great!!!! And Thank You for all the effort you put into your site and the great information you provide. Yes, I know how you feel. I delayed this a long time. It finally came about because I had to do some painting and carpeting, so I thought I’d just better get it done now. I have been using a small dining room table that came from Walmart. It is 36 inches deep by 58 inches long. It’s been a good desk and I managed to put a keyboard tray under it which I like. I’ll have to post a picture of it sometime. Thank you again Pat, Happy Holidays and best 73! Happy Holidays and best 73! That new solid oak table looks great ! I am using an old Atwater-Kent radio cabinet from the 1920’s for my 7300 , the MFJ roller inductor tuner, the 706 for 2M SSB and on the bottom shelf where the original batteries were located, I installed the Astron metered P.S. The Swan 500C and power supply , the Drake MN-7 antenna matcher is sitting on a 55 y.o. table built to hold boat anchors back in the day. Nice to see you here and thanks for commenting. I hope all is well. I had to look that up, “Atwater-Kent radio cabinet”. Now that’s a very cool idea. Very unique! That’s just I want, a table for boatanchors. I have an idea to add a table and make it an “L” configuration. I can have a place for boatanchors then. It’s in the plan! Thanks Mike, happy holidays and best 73! CUL on The Breakfast Club Net 3.973 MHz. 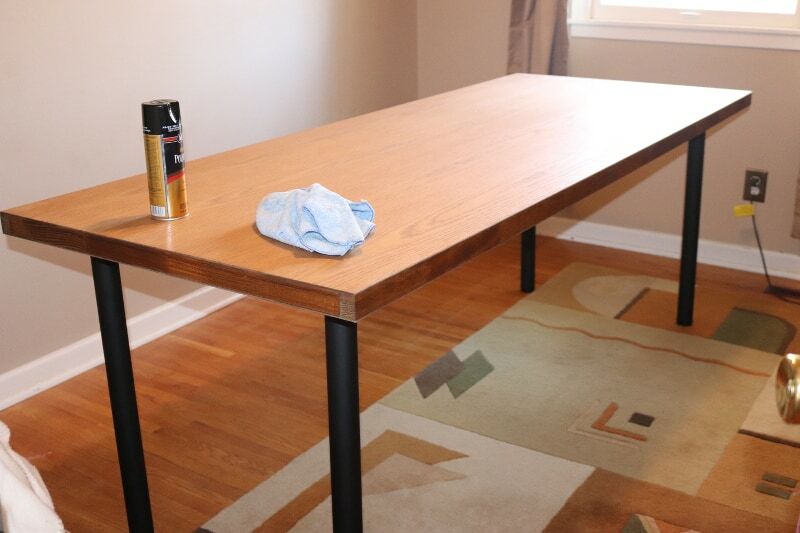 The desk looks very nice and the finish is great. I would have gone with a door desk when I added the shack on to the back of the house, except, I need drawers and shelves to put my junk on. Of course my wife say, “Get rid of some of that junk! !” She has a point, but after some 50 years in the game I just can’t part with some of it. Nice to hear from you and thank you for commenting. It’s coming together. I need some drawers too and I remember my first ham desk when I was 14yrs, had drawers. I’m going to have to do something to add some. I have some shelves closeby. Thanks for the reminder. Happy Holidays and best 73!